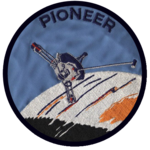 Pioneer 10 (oreeginally designatit Pioneer F) is an American space probe, launched in 1972 an wechin 258 kilograms (569 pounds), that completit the first mission tae the planet Jupiter. ↑ Fimmel, R. O.; W. Swindell; E. Burgess (1974). SP-349/396 PIONEER ODYSSEY. NASA-Ames Research Center. SP-349/396. Retrieved 2011-01-09. This page wis last eeditit on 15 October 2017, at 01:11.